The greatest compliment anyone can pay us is to refer their friends and family to our care. For almost 40 years, our customers have returned to us year after year, along with their friends and family members, making Colina Dental a part of their lives for nearly 4 decades. We have provided loving and attentive dental care for families with children, who have grown with us over many years. Children became teenagers, who grew into adults and eventually had children of their own. We are delighted to welcome them back every year and honored that so many continue to choose Colina Dental to care for their beautiful smiles. For a beautiful, natural looking smile, trust the cosmetic dental professionals at Colina Dental. Our team of experienced cosmetic dentists will take the time to understand your unique needs, and will develop a custom plan to give you the smile you want at prices you can afford. If you have missing teeth, chipped or damaged teeth or are embarrassed by your smile, we’ll do our best to give you a smile you’ll love, with a price tag that will make you smile even more! From dental implants, dental crowns, bridges and porcelain veneers to full mouth restorations, Colina Dental does it all at HUGE savings over most US dentists. 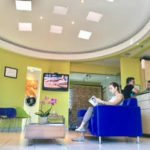 Recognized as a global leader in dental tourism, Colina Dental attracts thousands of American, Canadian and European customers who travel to Costa Rica every year for the exceptional quality, personal service and incredible savings that has made them a favorite among those seeking high quality dental care at affordable prices. WHITEsmile® offers professional tooth whitening products in the following categories: Home Bleaching, Power Bleaching, Whitening Toothpaste and complementary products. All tooth whitening gels are medical products and are available at Colina Dental.